Citation Information: J Clin Invest. 2007;117(3):773-783. https://doi.org/10.1172/JCI29850. Aldosterone plays a major role in the regulation of salt balance and the pathophysiology of cardiovascular and renal diseases. Many aldosterone-regulated genes — including that encoding the epithelial Na+ channel (ENaC), a key arbiter of Na+ transport in the kidney and other epithelia — have been identified, but the mechanisms by which the hormone modifies chromatin structure and thus transcription remain unknown. We previously described the basal repression of ENaCα by a complex containing the histone H3 Lys79 methyltransferase disruptor of telomeric silencing alternative splice variant a (Dot1a) and the putative transcription factor ALL1-fused gene from chromosome 9 (Af9) as well as the release of this repression by aldosterone treatment. Here we provide evidence from renal collecting duct cells and serum- and glucocorticoid-induced kinase–1 (Sgk1) WT and knockout mice that Sgk1 phosphorylated Af9, thereby impairing the Dot1a-Af9 interaction and leading to targeted histone H3 Lys79 hypomethylation at the ENaCα promoter and derepression of ENaCα transcription. Thus, Af9 is a physiologic target of Sgk1, and Sgk1 negatively regulates the Dot1a-Af9 repressor complex that controls transcription of ENaCα and likely other aldosterone-induced genes. Af9 Ser435 is phosphorylated by Sgk1 in vitro and is a major phosphorylation site in mIMCD3 cells. 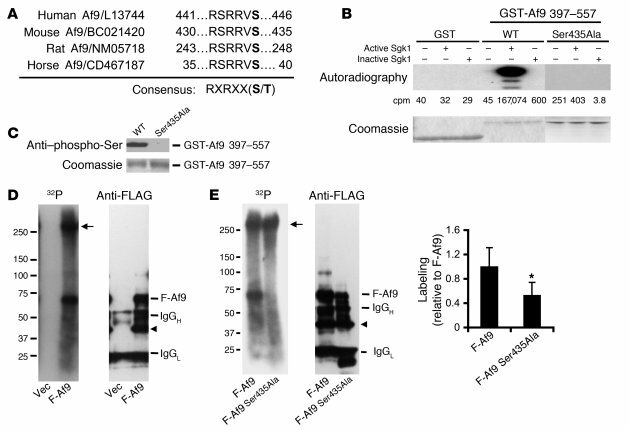 (A) Af9 possesses a highly conserved putative phosphorylation site, Ser435, for Sgk1. Shown are aa sequences surrounding Ser435 of Af9 (in bold) from different species. (B) Sgk1 phosphorylates Af9 in vitro. GST, WT GST-Af9 397–557, or GST-Af9 397–557 Ser435Ala purified from E. coli was phosphorylated in vitro in the presence of [γ-32P]ATP, separated by SDS-PAGE, stained (bottom), and autoradiographed (top). Mean 32P values (in cpm) of the corresponding bands are shown, with SE less than 25% in all cases (n = 3). (C) Af9 phosphorylation by Sgk1 requires Ser435. As in B, except for omission of [γ-32P]ATP (n = 3). (D) Af9 is phosphorylated in mIMCD3 cells. mIMCD3 cells transfected with pCMV500 vector (Vec) or pFLAG-Af9 (F-Af9) were labeled with [32P]orthophosphate and analyzed by IP-IB with the FLAG M2 antibody. A representative autoradiograph (left) and corresponding IB (right) are shown (n = 3). Arrow denotes unknown protein; arrowhead denotes possibly degraded Af9 fusions. (E) Af9 Ser435 is a major phosphorylation site in mIMCD3 cells. As in D, except that pFLAG-Af9 Ser435Ala construct (F-Af9 Ser435Ala) replaced pCMV500. A weak band migrating at the position of FLAG-Af9 Ser435Ala was visible after exposure of 12 more hours. Plot of the 32P signal normalized to the corresponding protein abundance of each Af9 fusion, with WT Af9 labeling assigned as 1 (n = 5). *P < 0.05.